Newport have signed prolific non-league striker Tom Meechan. The striker, 25, joins from St Neots Town of the Evo-Stik League Southern Premier, where he leads the division's goal-scoring charts with 21. The striker had previously played for St Ives Town and made the switch to Godmanchester Rovers in the summer of 2014 and scored 53 goals in the Thurlow Nunn League, Premier Division. "Scoring goals is my main asset," Meechan said. Meechan, a qualified maths teacher, admits he thought his time to make it as a professional had passed. "I had thought that maybe it was a little bit too late for me to make the step up to the Football League, but I am delighted to have the chance to make the progression here at Newport County," he said. "I just want to come in and work hard and see where things go from there." Meechan's signing is reminiscent of Newport's capture of ex-St Ives Town striker capture of ex-St Ives Town striker Conor Washington, whose sale to QPR whose sale to QPR earned Newport £800,000. "I know that there were a couple of clubs chasing Tom, and we are delighted to have him here," said Newport manager Warren Feeney. "It is a great chance for Tom, coming into a professional environment and we have all seen his impressive goal-scoring record. "Our job is now to get Tom up to speed with the level of football in the Football League, which he will achieve by working hard and surrounding himself by the good players that we have in this squad. "I have been impressed with Tom's desire to play in the Football League and hopefully he can take this great opportunity to make a name for himself." 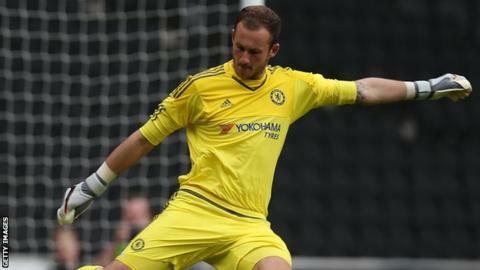 Newport County have extended the loan of Chelsea goalkeeper Mitchell Beeney. The 20-year-old has played four times for Newport since signing and will provide competition for Joe Day. The goalkeeper will now stay with the Exiles for a further two months, inclusive of Newport's trip to Stevenage on 16 April. "I'm delighted that Mitchell has chosen to extend his stay with us. I am very pleased to have him on board," Feeney added. "The whole squad has taken to Mitchell and I want competition for places. I have three very good goalkeepers in the squad at present and I want to keep that competition for places, as it keeps everybody on their toes. "I have been very impressed with his performances so far. He comes from a very good footballing upbringing at Chelsea and he is a player that I am delighted to have at my disposal."